I'm sure many have heard about the beneficial properties of the mushroom Veshenka. However, few know what dishes they can cook. Meanwhile, these mushrooms are readily available, they are very easy to cook and they have a refined taste. This, together with their unique healing properties makes the oyster a welcome guest on our table. And the possibility of a microwave oven can help you save time in the kitchen and eat a healthy diet we are such busy people.Very easy to prepare oyster mushrooms stewed with sour cream. Onion cut into thin rings, put in a bowl with butter and warm up for 2-3 minutes at medium power furnace. Add the sliced mushrooms, pour water, add salt and pepper. Warm up 3 min at the same power. Then stir the mushrooms and simmer for 6-8 min at full power. Add sour cream and cheese. From the protein to separate from the yolk and pour the last in the dishes where prepared mushrooms. Add finely chopped dill, stir and simmer for 1-2 minutes at full power. 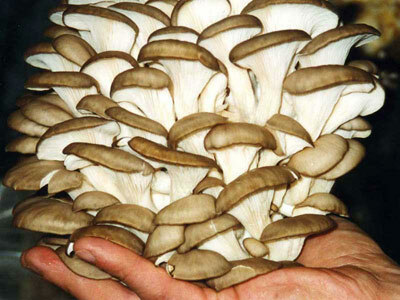 When I choose the oyster mushroom in the store, pay attention to its appearance fresh mushrooms elastic, does not break when pressure is applied, beautiful colors (colors may be different), without impurities color stains. Sold by oyster usually Packed 450-500 g.